Bob Holden (Democrat), the 42nd State Treasurer, was born in Kansas City on Aug. 24, 1949, and was raised on a farm in Shannon County near Birch Tree. In 1973, he graduated from Southwest Missouri State University with a degree in political science. He is a graduate of Harvard University's Kennedy School of Government for Public Executives and the Flemming Fellow Leadership Institute. His career in public service began in 1976, when he served as an assistant to the State Treasurer of Missouri. 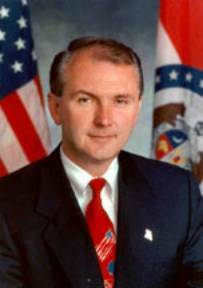 In 1982, Mr. Holden was elected to the Missouri House of Representatives from the 136th District in Springfield. He served three terms in the House from 1983-1989. He was elected state treasurer in 1992 and again in 1996. In 1993, the state's unclaimed property program was transferred to the treasurer's office. At the time, the office held more than $100 million. Mr. Holden was elected Missouri's 53rd governor in November 2000 and served until 2005. Mr. Holden is married to Lori Hauser Holden, and they have two sons, Robert Lee Holden III and John D. Holden. They live in Jefferson City.